The unique FILL ‘N CHILL® Party Table was created by Sharon and Mike Pote. The story began in the summer of 1994, when Sharon and Mike hosted their first-ever Porky Pote’s Pig Roast. They invited family and friends over to their home for an afternoon of food, fun and games for the kids. Many of their guests offered to bring salads and desserts for the day’s festivities. There would be plenty of good things to eat—and a lot to keep cold. The day of that first Porky Pote’s Pig Roast was typically hot Chicago-area summer weather. However, as the old saying goes, necessity is the mother of invention, and Sharon and Mike were ready. In trying to solve their dilemma, the two had hit upon the idea of a chilled serving table. 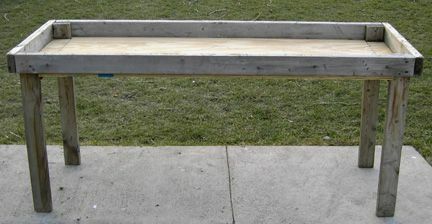 Mike constructed a crude, six-foot long table from wood and lined it with a large sheet of plastic. Crossing their fingers, Sharon and Mike filled their table with lots of ice, set out the food, and started greeting arriving guests. Nearly ten years after building that first table, Sharon and Mike decided to go forward with their concept. They have put a lot time and effort into their design. The result is the one and only FILL ‘N CHILL® Party Table! In late 2017, Chillin Products became part of McCourt Manufacturing, located in Fort Smith, Arkansas.